The weather’s nice and you’re ready get outside and cut the grass. But after a long winter’s storage you’ve discovered a problem with your Greenworks lawn mower. Let’s go over the most common problems owners run into, and how you can fix them quickly. The most obvious reasons why a mower won’t start is lack of power. If you’ve plugged in the cord or inserted the battery, put in the key (not all models have keys), pushed the button, and nothing happens, there are just a few reasons why. Greenworks batteries last up to about 2,000 charges and have a 2-year warranty. If your battery is more than three years old, or if it has been exposed to extreme heat (like the dashboard of a car in the summer), it may not be performing the way it did when it was new. High temperatures kill the battery, and could make it leak or explode. If you have access to another Greenworks battery, try swapping it with your old one to see if the mower starts, and also if your charger is working properly. If you have a cord ed electrical mower, see if the outlet you’re using is working. Sometimes the power gets shut off or a breaker has tripped. Test the outlet with a different electrical appliance. Check the extension cord for wear. Test it with a different electrical appliance, too, to see if power runs through it properly, or if it has a short. Try to start the mower with a different extension cord. Make sure the wire has the correct gauge (see below for more information). Once in a while the starter will have failed. If the two prior steps of checking the battery and charger and cord and outlet aren’t resolving your problem, it’s time to call for help. Greenworks has a toll-free helpline: 1-888-909-6757, or 1-888-90WORKS. These are not noisy gas lawn mowers, so if your mower is shaking and making unusual noises, turn it off. Unplug it or take out the battery. 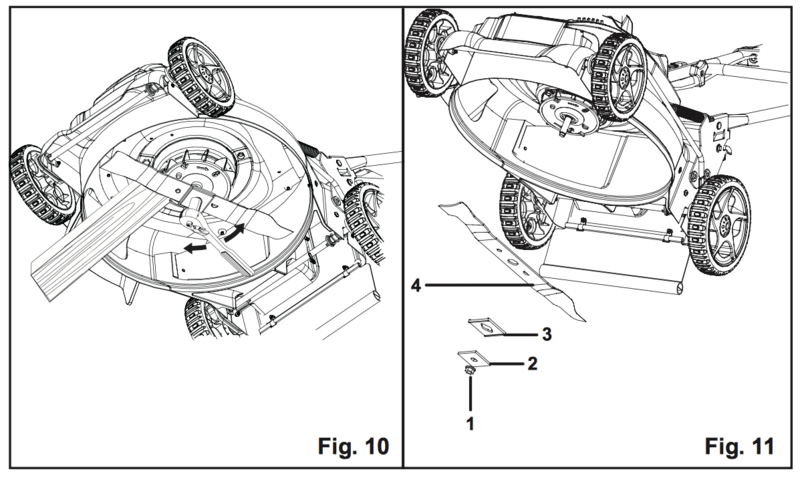 Then tip it on its side and take a look underneath. The blade could be unbalanced if it was sharpened too much on one edge. Remove the blade. Buy a cheap little conical plastic balancer at a lawn and garden center and lay the blade onto it. That makes it easy to see if you’ve sharpened it correctly. (You can also hang the blade on a nail through the center hole.) If one side hangs lower than the other, your blade is out of balance. You can file or grind the edge that hangs lower until the blade hangs level. The blade may be incorrectly mounted. Check the orientation in case someone mounted it upside down. Worst case scenario is that the blade is bent or badly dinged up enough that you’ll need to buy a new one. If the blade looks okay, see if the motor shaft looks damaged. If that’s the case, it’s time to call Greenworks or a lawn mower mechanic for help. This is a rather rare problem if you don’t usually run over rocks, branches, tools, or toys while you’re mowing. Give the blade a closer look if you know you haven’t been maltreating your mower. There are a few things that can cause your mower to behave badly. Not enough electrical power, dull blades, very tall grass, and wet conditions are some of the challenges you might face. If you’ve not had to do much with extension cords and power tools, you might not know that you need increasingly thicker wires to carry enough electricity over longer distances. If your cord can’t get enough electricity to your mower, your mower will not work properly. 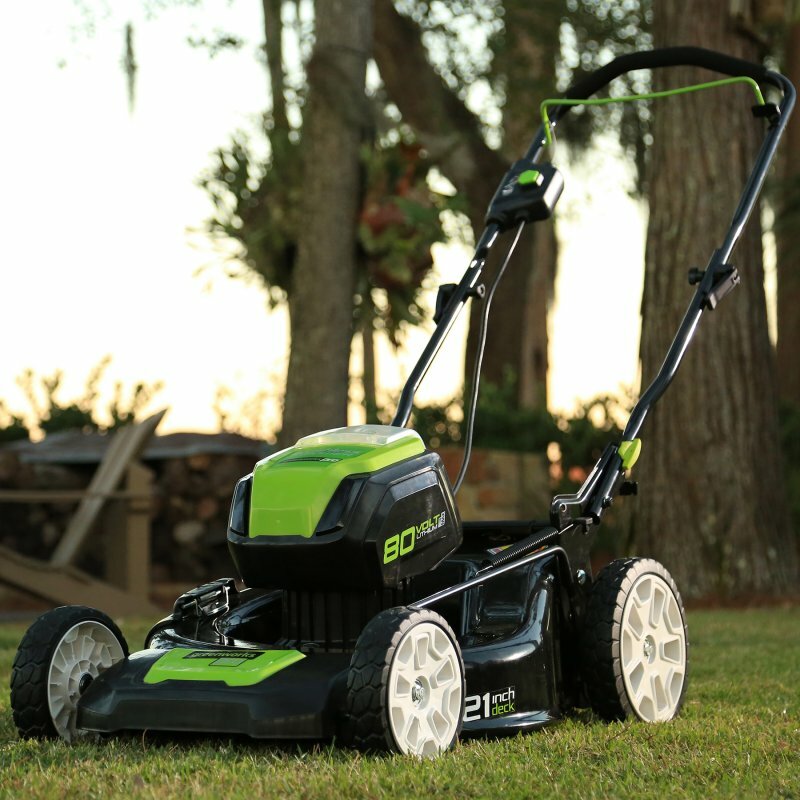 For example, the Greenworks 21” electric mower requires 13A of current. If you have a tiny yard, you can use a 50-foot cord with 16-gauge wire. But if you use a 100’ cord, you’ll want 14-gauge. The maximum cord length they recommend using is 150’ of 12-gauge wire. It sounds backward, but the smaller the gauge number (AWG), the thicker the wire is. All work and no sharpening will have your lawn mower tearing out the grass instead of cutting it. Use a metal file to hone the cutting edges every couple of weeks, or at least once a month if you have a small lawn. You can also use a grinder, but take it slow if you don’t have a lot of practice sharpening blades. It’s easier if you have a second blade so you can swap them. One goes into the shop for sharpening while you mow with the other. Mother Nature doesn’t always consult our schedules, so the ground may be too wet for you to mow when you have time to do it. Wet grass will stick to the underside of the deck and the mower won’t mulch nicely. If it’s not mulching at all, you may have forgotten to insert the mulch plug. Soft, muddy ground or a full bag of clippings will make the mower much harder to push. If you can put off mowing till the yard dries, your grass and your back will thank you. If you absolutely must cut the lawn, raise the height of the deck and see if that helps. 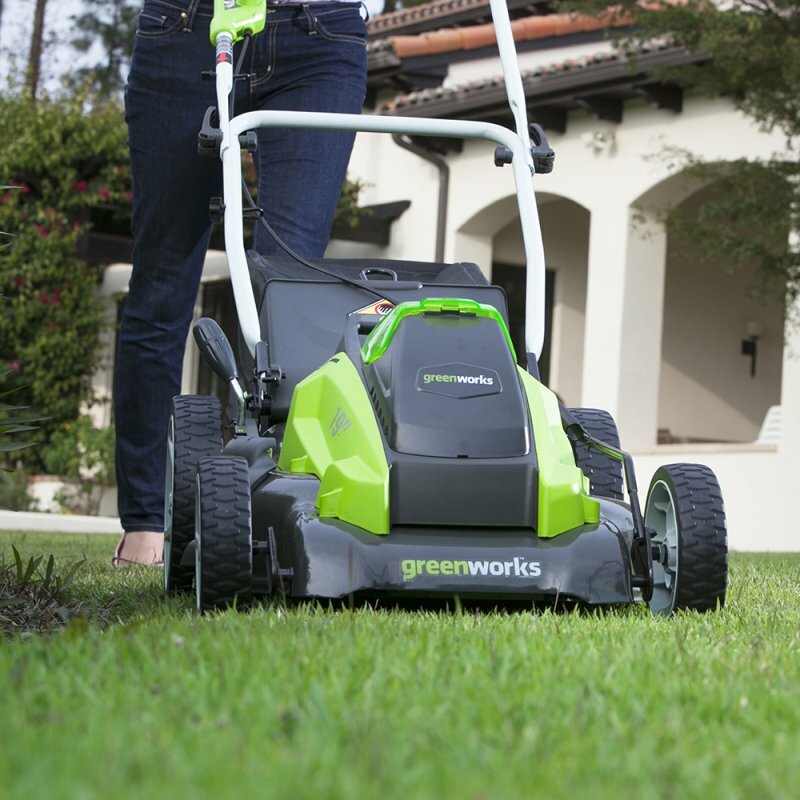 Greenworks mowers are best-sellers partly because they are easy to use and maintain. Keep the battery charged, check your extension cord, sharpen your blade, and give the underside of your mower a good cleaning once a month and before storing it for the winter. Happy Mowing! Hi James, I have 21in ch corded GWs mower. It would not start and I felt a little resistance in the button, I opened the starter case to check for anything obvious and 3 pieces fell out before I could see their placement. Is there a schematic so I can put them back in the correct place? Same thing happened to me. I would like to be able to put it back together myself instead of having to see a repair person. I bought a 40v Dual Blade mower last month, and after using it twice, I have two charged batteries but when I squeeze the bale and push the button, I hear a mechanical click inside the start button housing, and the mower won’t start. I made the mistake of attempting to open the button housing and of course, parts flew. I’ve got a call in to the repair line now, and I’m about to bring the mower in for service this week. I have a 24 volt GW that is apparently charging up, but only runs for a couple minutes, if that. I put it back on the charger and checked it in a couple hours and the battery had gotten hot–not too hot to touch, but hot. This is the first time we tried to use it this year. I have been fairly diligent about charging it up monthly over the winter–maybe once or twice let it charge for more than 24 hours. Ed, I’ve experienced that problem as well. I’m afraid it means the battery life is gone for some reason. You will need to replace it. I have a corded mower. Worked fine last year. This spring it only clicks in the engine area when I try to srart it. It does not throe any circuits. Carol, I’m not sure what the problem is. There is a part in some mowers called a rectifier that converts a/c electric to d/c to run the mower. It may not be functioning. The best thing to do is to call Greenworks’ help line at 1-888-90WORKS (888.909.6757) to see if they have a suggestion for you. I have 2 x 40V batteries that have worked like a charm for the last 2 summers. This summer, I am having problems with them it seems. I have a full charge on both of them and can get about 5min of cutting before to mower stops. I cleaned out the under part thinking there may have been some resistance but it did not make a difference. When I check the batteries for charge the indicator lights are giving me full charge or one light used. Therefore it looks like the batteries are OK but can’t get the lawnmower to start for more than 5min after recharging. From my research, the batteries should be good for 2000 starts which is no where close to what I have used them for. Shelby, thanks for checking in. During the off season when not in use, the batteries should be charged up periodically. If they are allowed to discharge for a length of time they may not charge properly, even though they show to be fully charged. You can check with Greenworks’ help line at 1-888-90WORKS (888.909.6757) to see if they have a solution without replacing the batteries. I am also having this problem, any solution. I bought the 17″ cordless lawn mower in April. I have not had a problem with it until this month. It will not start. I checked the battery and it is fully charged. The outlet is good and there are no issues with the charger. I tried to call the help hotline, but was on hold for over fifteen minutes without anyone coming on the line to help me. I finally got it started, but then it dies shortly after. I don’t know if I really want to call the hotline again and sit there for who knows how long til someone finally gets to me. I am currently looking for the reciept, but I don’t know if Menard’s will help me. Any advise? It is hard to say what the problem is. I would try the hotline again, but try to call early–be the first caller. The wait time is usually shorter in the earlier morning. Good luck. Can a 36V Greenworks rechargeable battery be replaced with a 40V battery on a 19” Lawnmower? I am not even sure that Greenworks makes a replacement battery for this model—I bought it at the end of 2013 and it has workded great up until this point. The battery has all 4 green lights that says it is charged but when I run the lawnmower it only stays on for about 10-15 seconds. Does it look like I just need to buy a newer lawnmower? Hi, Have a 40v Lithium-ion Dual Blade Mower. One 4 amp and one 2 amp battery. Batteries are charged. Put them in the mower and it starts but there is a red light above the left hand “Standing behind the mower” battery insert compartment. I cannot find anything on what this light means. The right hand compartment has a red light but it is not lit. Anyone know what these lights mean? Hi, I have the same 40v Dual Blade Mower and also have this red light behind the left battery insert compartment on. I switch the batteries thinking that the right red light will goes on instead of the left one but nothing changed, only the left red light is on.The mower runs fine, I don’t feel that something is wrong. I found nothing in the Owner manual about these red lights. Anyone know what these lights mean? Same problem with left red left light. Also replaced blades with new ones and they do not cut. New blades had an edge. Observed blade direction upon installation. Nancy, you can locate one on the Greenworks website: https://greenworks.ordertree.com/dealerlocator. Or, you can call their service center at 888-909-6757. I was using my 120 VAC,13 Amp corded mower in high grass and the circut breaker tripped. It trips each time I try to start the mower. Is there a reset or thermal overload on the mower? I have the one with two blades, and one blade stopped spinning which stops the mower. There is nothing in the way of the blade and the bolt is tighten. Any ideas?